We offer training in Microsoft Excel and Microsoft Access, as well as the rest of the Microsoft Office Suite, including SharePoint, Azure, and SQL Server. 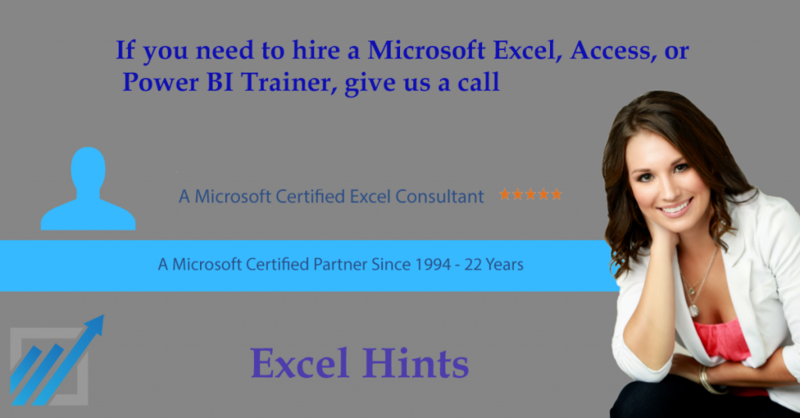 We do so as Microsoft Excel and Access experts, and Microsoft Excel MVPs. We conduct our Microsoft application training on-site at your location, or at a location near your office such as a conference room in a local hotel or convention center. One-on-one training – There is no way to learn faster than this! If that does not match your needs we can do it remotely via GoToMeeting or GoToWebinar, based on your needs and budget. Remote training is discounted from our onsite training due to travel time and costs. Our training sessions range from 1 hour up to 3 days, based on your exact needs. All of our training is created specifically for you and your firm’s needs, not someone else, nothing canned. You are not over paying for a canned presentation by an unqualified or unmotivated instructor. Teaching Microsoft Excel and Access is our passion, and we are determined to dramatically increase your working knowledge of Microsoft Excel and Access programming. If you would like to discuss your training needs and options please call or email today. We can get you the answers you need so that you make your decision.